While America’s CEO/Dictator, Donald Trump, continues to receive bad news about the Mueller investigation, he’s basically swept the murder of journalist Jamal Khashoggi under the carpet instead of confronting his new best friend, authoritarian Saudi Crown Prince, Mohammed bin Salman. The Senate is currently trying to put together a bipartisan bill to force sanctions on Saudi Arabia. Will they be able to do it? Pardon our skepticism but considering their past performance these past two years, probably not. 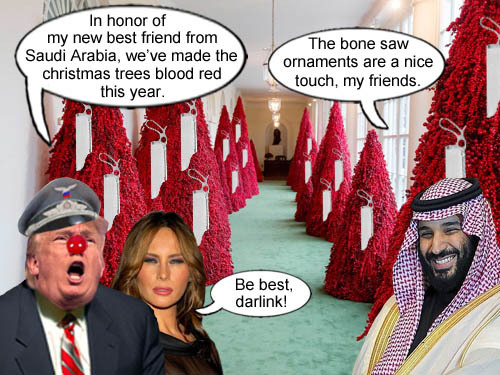 The Trumps reveal their artistic blood red christmas trees with innovative bone saw ornaments in honor of their authoritarian friends in Saudi Arabia.